Guigal is one of those names that even novice wine geeks latch on to, famed for their three single-vineyard Côte-Rôties, La Mouline, La Turque and La Landonne (known colloquially as the La Las). These are true trophy wines, and their celebrity status and low production makes them very expensive. As well as making domaine wines, Guigal is a negociant business, buying both grapes and finished wines from a network of growers. Quality of the negociant wines varies a little, and they are usually not the best values in their respective appellations. Having said this, they are usually pretty good, especially the Condrieu and the inexpensive Côtes du Rhône. The Guigal story is a fascinating one. In part, the resurgence of interest in Côte Rôtie can be put down to the success of Guigal's top wines. This is an appellation that in the 1960s was down to 60 hectares, but now has rebounded to 260 hectares (still a small appellation) with prices creeping up to ever higher levels. The irony is that Guigal's La Las are, with their 42 months in new oak, rather big wines that perhaps don't show off all that these special terroirs are capable of. But still, they are striking wines, and they age pretty well. So, the Guigal story. Etienne Guigal began working as a cellar hand at Vidal Fleury in 1924s, when he was just 14. By 1946 he had become the cellar master, and began his own domaine in Ampuis, in the heart of the Côte Rôtie appellation. In 1961 Etienne became blind and his son Marcel joined him in running the estate. Today, third generation Philippe, son of Marcel, is in charge of winemaking. The success of the Guigal negociant business meant that by the mid-1980s they were able to buy Vidal Fleury, where Etienne had started out. Etienne died in 1988. 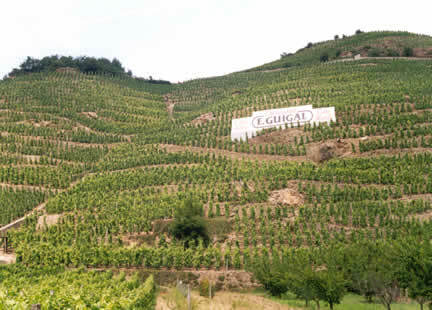 In 1995 Marcel purchased the Château d’Ampuis, and in 2001 Guigal purchased both Grippat and de Vallouit. More recently, Domaine de Bonserine was purchased in 2006.